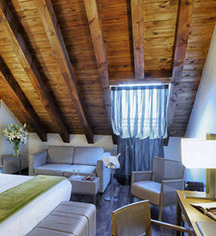 All guestrooms at the NH Collection Madrid Palacio de Tepa feature exquisite details of 18th century Spanish architecture, combined with modern amenities and breathtaking views of the neighborhood’s lively streets and squares. Natural light floods in through large windows into the elegantly decorated, crème color scheme accommodations. High vaulted ceilings are a standout feature of many rooms, and those on the fourth floor have its own balconies overlooking the chic neighborhood. 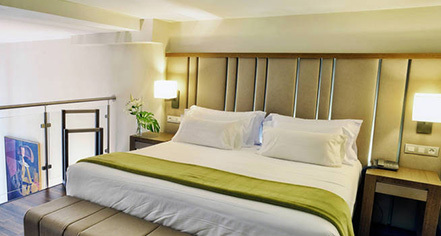 NH Collection Madrid Palacio de Tepa features a variety of accommodations to find the perfect place to stay in Madrid, whether it be a trip for business or leisure. Guests can enjoy luxury amenities such as mattresses designed exclusively for the NH Hotel Group, rainfall showerheads, Nespresso coffee and tea making facilities, 46” LED televisions, 1MB of easily accessible WiFi, plush bathrobes, and professional hair dryers.